Living a Fit and Full Life: Go Vegan this Halloween with YumEarth's Gelatin Free Halloween Gummy Bears and Gummy Worms! + Giveaway! Go Vegan this Halloween with YumEarth's Gelatin Free Halloween Gummy Bears and Gummy Worms! + Giveaway! Two dads with young children, founded YumEarth out of their commitment to feed their families a diet rich in delicious honest foods. They love dreaming up mouth-watering treats that burst with yum, a combination of their award winning flavors and their dedication to the finest ingredients. 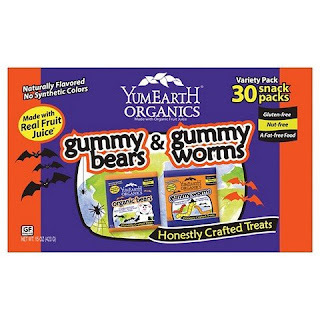 YumEarth world famous YumEarth gummies, fruit snacks, licorice, lollipops, and other treats are honestly crafted with their legendary flavors and are gluten-free so everyone can enjoy. YumEarth is excited to announce that our special edition Halloween gummy bears and gummy worms do not contain gelatin and are vegan this year! They may be a little softer than their regular gummies but they are just as delicious. No Artificial Colors No Artificial Flavors Made with Real Fruit Juice USDA Organic Each Pop Only 22 Calories Gluten-Free 100% Daily Vitamin C Per Serving Fat-Free Nut-Free Kosher Parve No High Fructose Corn Syrup Assorted Flavors Pomegranate Pucker Wet-Face Watermelon Strawberry Smash Googly Grape Very Very Cherry Perfectly Peach Razzmatazz Berry Mango Tango YumEarth was born out of our commitment to feed our families a diet rich in delicious healthful foods that are free of chemicals. YumEarth tastes much better because we choose real fruit extracts and planet friendly ingredients grown o sustainable family farms to sweeten our lives and yours. YumEarth. Good for us. Good for Mother Earth. 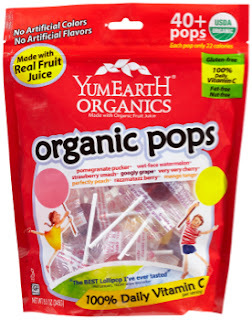 YumEarth has a wonderful selection of delicious organic candy that's perfect for any occasion. I love Candy but hate all the junk that comes in most non-organic candy. With YumEarth I don't have a thing to worry about and have no guilt when I allow my kids a treat from YumEarth. 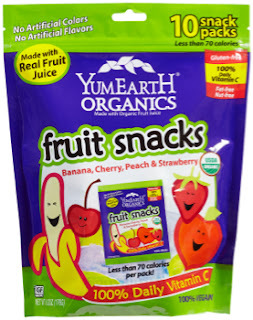 This year I plan on handing out YumEarth delicious organic candy to the neighbor kids that trick or treat at our house. YumEarth has special edition Halloween gummy bears and gummy worms that don't contain gelatin which makes them vegan! 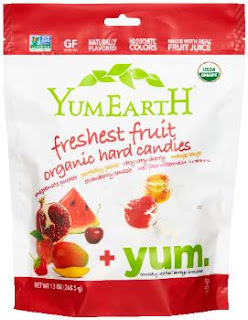 So now even vegans can enjoy YumEarth candy! YumEarth is also gluten free so just about anyone can enjoy them! Click HERE to purchase YumEarth Halloween candy! Click HERE to find a store near you that sells YumEarth! Click HERE to learn more about YumEarth! Follow YumEarth on social media!